The Roscoe Medical Maverick Heavy-Duty Aerosol Compressor is designed for efficient, continuous high-pressure performance. The powerful piston compressor delivers 50 psi at maximum pressure, dispensing all types of medication quickly and effectively. The Roscoe Maverick Compressor is durable and easy-to-clean with a portable design for easy transport. 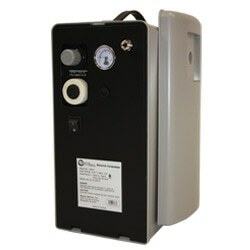 This Roscoe Medical Maverick Compressor is used with hand-held nebulizer systems, heated nebulizer, dual action humidifiers, deluxe nebulizers with oxygen diluter, high output pneumatic nebulizers and mist tents from pediatric to adult use.